A lumpy caulk job not only detracts from the appearance of your bathtub, it can fail to serve the purposes you caulked it for in the first place. As with all things, caulking a bathtub is something that gets easier with practice. But if you’re a DIYer, how much practice can you realistically expect to have? And without that practice, should you just accept less-than-ideal results? There are really two choices here: you can lower your expectations, or you can learn how to caulk like a pro. The latter, of course, provides the larger benefit and, believe it or not, is actually not difficult at all. You just need to know the proper steps. · Smooth your edges – wet your pointer finger and run it along the length of the caulk bead on all sides. Clean excess caulk off of your finger at regular intervals using a damp rag. Once your caulk has dried, carefully remove the masking tape from around the joints. Do not remove the tape when caulk is still wet. 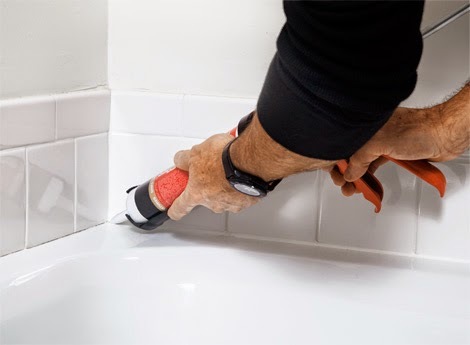 In addition to tubs, this caulking technique can be used for tile, sinks, and other household items, and is well worth taking the time to learn. When you know how to caulk properly, you can produce professional results at a fraction of the cost, and earn some well-earned bragging rights along the way.